Featuring world-class music, art, sound and lighting talent and a refreshing lineup of speakers and workshops completely new to the festival space, Outside In Equinox is a celebration of the changing season through the discovery of the future yet to come. Kindly remember, all sales are final - NO REFUNDS. Ticket Holder voluntarily assumes all risks and danger incidental to the event for which the ticket is issued. Ticket Holder voluntarily agrees that the management, facility, promoters, participants, OI Equinox Fall 2018 LLC and all of their respective agents, officers, directors, owners, and employees are expressly released by Ticket holder from any claims arising from such causes. This ticket is not subject to any refund and shall bear no cash value. If issued complimentary, this ticket shall not be exchangeable. Management reserves the right, without refund of any portion of the ticket purchase price, to refuse admission to or eject any person whose conduct is deemed by management to be disorderly, who uses vulgar or abusive language or who fails to comply with these or other management rules. Breach of any of the foregoing will automatically terminate this license. NO REFUNDS. NO EXCHANGES EXCEPT AS PROVIDED HEREIN. EVENT DATE & TIME SUBJECT TO CHANGE. ALL RIGHTS RESERVED. This ticket is a revocable license and admission may be refused upon refunding the face amount of the ticket. Unlawful resale or attempted resale is grounds for seizure and cancellation without compensation, Tickets obtained from unauthorized sources may be lost, stolen or counterfeit, and if so are void. Ticket Holder acknowledges that the event may be broadcast, recorded, or otherwise publicized, and hereby grants permission to utilize holder’s image or likeness in connection with any live or recorded transmission or reproduction of such event. In conformance with some local requirements or certain facility rules, alcoholic beverages, illegal drugs, controlled substances, cameras, recording devices, bundles, and containers of any kind may not be brought into the premises. This ticket cannot be replaced if lost, stolen or destroyed, and is valid only for the event for which it is issued. This ticket is not redeemable for cash. By purchasing this ticket you are entering into an agreement with OI Equinox Fall 2018 LLC for creative commons and understand that your image may be utilized by OI Equinox Fall 2018 LLC for marketing and promotional materials. Ticket Holder voluntarily assumes all risks and danger incidental to the event for which the ticket is issued. Ticket Holder voluntarily agrees that the management, facility, promoters, participants, Lucidity Festival LLC and all of their respective agents, officers, directors, owners, and employees are expressly released by Ticket holder from any claims arising from such causes. This ticket is not subject to any refund and shall bear no cash value. If issued complimentary, this ticket shall not be exchangeable. PLEASE NOTE THIS TICKET IS ONLY VAILD FOR ENTRY WITH A 3 DAY FESTIVAL TICKET. *Ticket holder MUST have accompanying 3-Day Pass. This pass allows 1 vehicle to park in the campgrounds. You will be guided to a safe parking spot. *This pass is good for one (1) four-wheel vehicle up to 18' in length. Any vehicles of greater length or towing a trailer must purchase a RV Pass. *Ticket holder MUST have accompanying 3-Day Pass . This pass allows one RV or trailer between 18 - 30 ft to park on the festival grounds. You will be guided to a safe parking spot. Arrive and relax in style with your very own luxury camping set up! Included with the luxury tents are 1 queen bed OR 2 double beds, area rugs, bedside tables / storage crates, deluxe lantern, and blankets/pillows to keep you cozy. Also included in this package are 2 full weekend passes including Thursday Early Entry, and one car camping pass (for one vehicle under 18ft) so that you can park near your tent set up. Everyone under 18 must be accompanied by a parent or legal guardian. Special pricing for kids tickets will be available at the on-site box office during the event. Ticket Holder acknowledges that the event may be broadcast, recorded, or otherwise publicized, and hereby grants permission to utilize holder’s image or likeness in connection with any live or recorded transmission or reproduction of such event. In conformance with some local requirements or certain facility rules, alcoholic beverages, illegal drugs, controlled substances, cameras, recording devices, bundles, and containers of any kind may not be brought into the premises. This ticket cannot be replaced if lost, stolen or destroyed, and is valid only for the event for which it is issued. 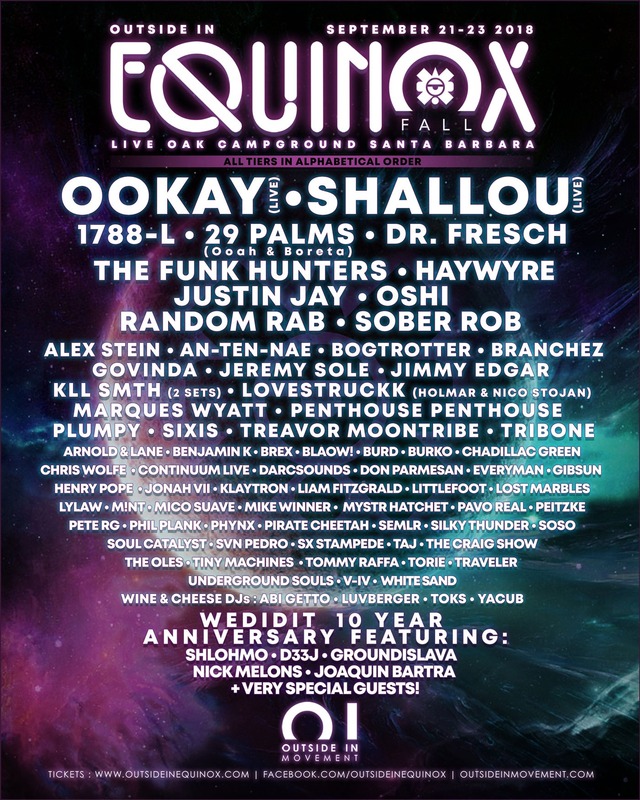 By purchasing this ticket you are entering into an agreement with OI Equinox Fall 2018 LLC for creative commons and understand that your image may be utilized by OI Equinox Fall 2018 LLC for marketing and promotional materials. A celebration of change at the apex of seasonal shift. Outside In Equinox is a communal 3 day camping experience ushering in the Autumn season through the exploration, discovery & celebration of technology and the evolving human experience. With daily topics and themes ranging from decentralized blockchain technology, to virtual reality & AI, to alternative healing & ET Disclosure, attendees will embark on a journey of their choosing and go as deep as they desire while they explore the many thematic sections and interactive installations within the festival. Engage renowned experts in their field up close, attend workshops and explore new technologies while surrounded by the serene, natural beauty of the Santa Barbara Mountains. OI Equinox will feature a number of special events including a late night video game tournament, a cryptocurrency airdrop for a new game-changing blockchain protocol and a special ceremony at the exact Autumn Equinox moment on Saturday afternoon. Technology will blend with nature as a world-class line up of music, visuals, sound and art paint the beautiful Live Oak Campground landscape well into the night. The phase 1 music artist lineup will be announced July 1st and we promise, will not disappoint. A complete festival website is launching soon with full details of the event. Outside In Movement is a community focused directive, centered on changing the planet for the better through innovative technology, out-of-the-box thinking and artistic expression. We are proud to partner with uber talented friends and colleagues in the music, art and event space as well as some of the greatest minds in alternative health, science and philosophy. A percentage of proceeds will go to charities benefitting those effected by the Thomas fire and mudslides. Bring your outside in and join the movement on the community Discord channel today!